The highly individual and evocative ceramics of Auckland artist Virginia Leonard are honest self-portraits that address her bodily scarring and experiences of chronic pain, injuries obtained in a serious motorbike accident in London in 1986. This event left Leonard hospitalised for two years and “changed and formed” the artist, which she recounts as having both a negative and positive impact. Confronting these issues, Leonard’s wonderfully experimental ceramic practice employs the flesh-like materiality and tactility of the medium, and the physical presence of the sculptural form, to forge a personal material vocabulary for her body’s scars and pain. As Leonard states, “chronic pain has no biological value. Modern medicine cannot reliably treat chronic pain. Chronic pain lacks both language and voice...the language of my clay making is my attempt to rid my body of trauma and reduce my level of chronic pain”. The results are unique, emotive, visually arresting ceramic works that stand like materialised acts of internal speech and sensation bursting forward in the fluidity and sloppiness of clay. Following a successful painting career in New Zealand, Leonard started working with clay in 2013 - “The transition grew from my need to address my bodily issues. Clay became more visceral and bodily. It was oozy and clumpy. It resembled my scarred and jaggered leg. It’s also a precarious medium. You don’t know if the work is going to survive the high temperatures of the kiln. is reminded me of the fragility of my body”. Now working predominantly in raku and porcelain, Leonard is largely self-taught and her innovative ceramic practice is driven by the tactile material possibilities of clay for expressing and connecting with her body and chronic pain. Discussing her process Leonard writes, “ there is always a strong narrative within the work and that narrative really depends on how my body is feeling on the day. This decides what happens to the work. Clay is an extremely material and emotions come into play easily when I am manipulating the clay”. While ceramics is currently Leonard’s primary focus, the artist’s training as a painter is integral to her approach - “I treat the material of clay similarly to how I treat paint and painting...I move the clay like I move paint on a canvas. I make the material gestural when building my constructions... the rougher and more gestural the better. The closer I am to representing my broken body...But within this loose way of making I always have in mind the formal aspects of abstract painting”. 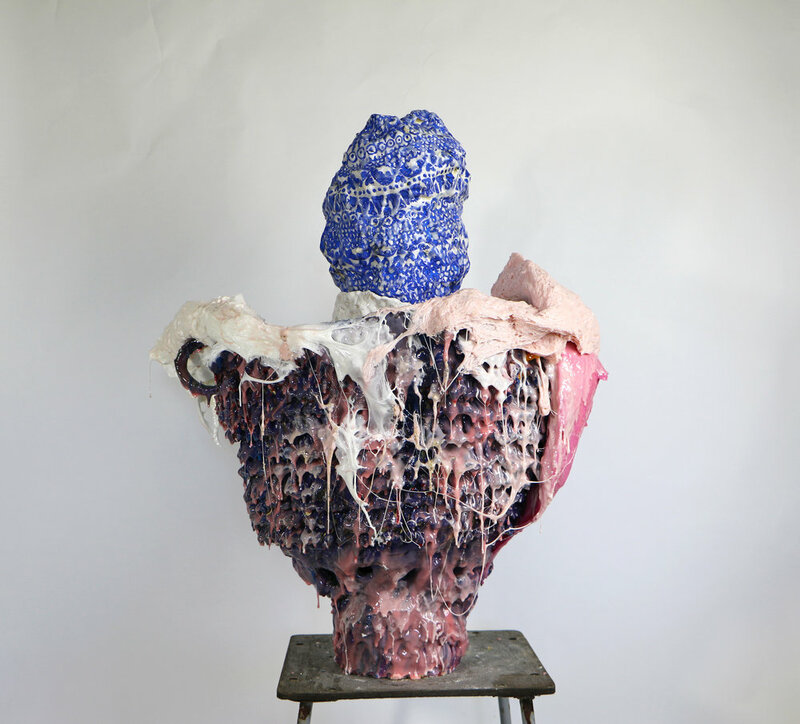 Leonard’s recent ceramic works evolve from a process of stacking, in which the artist piles random individual pieces on top of one another, a methodology she refers to as “building precarious towers resembling my human form”. Important to the development of the work’s stature is not only that it’s life size but also that it’s confronting and that it’s positioned at eye level with the audience. Also as Leonard adds, “layering the work and stacking the work also references surgery and the ability to hide my bodily scarring, the more I assemble the more there is to look at which takes the viewer’s eye away from the ugly bits”. In this encounter we are met by collections of nobly rounds, curiously human shaped vessels with deformed handles, prickly cones, and boxes fused shut with wonky lids. Each distinct element seems to be resting after contorting in spasms of movement, huddled together for support. Like the “maps” of injury that Leonard carries around on her body, these assemblages are often covered in rippling fields of spikes, oddly shaped nodules and rounds, and blankets of seeping, suffocating glaze. The artist also often inserts sharp objects such as shards and nails, alongside pieces of fur, to highlight surgery and her post-operative care. As Leonard writes, “It comes from a memory in my early twenties lying in a hospital bed with an external fixator. The nails and bolts held my leg together. The fur protected my body from bed sores...it was pretty horrifying and I still remember it like yesterday. So the nails are very poignant”. The glazing and ring are also fundamental to Leonard’s exploration of her body’s impairments, and how this might be reflected in the material vulnerability of the clay itself. As she outlines, “I’m very interested in pushing the clay and glazes beyond their limits, it seems to have become an important part of my process, work that has cracked and split just before breaking point or nearing collapse. It represents my broken body. Sometimes I do this on purpose other times they will crack and collapse on their own. This is always my favourite part of the process, I can’t control it”. Leonard’s glazes echo her vibrant canvases, being amazingly painterly in application and demonstrating her understanding of palette and nuances of tone. The artist uses combinations of under glazes, stains, metallic lustres and resins, which are applied in sweeping, gestural brushstrokes or left to congeal in voluptuous drips, drawing our attention to the materiality of the glaze itself. Describing her glazing technique Leonard writes, “I overload the glaze with under glaze then re it at a high temperature. It creates a scarred, skin like texture over the body of the work”. Leonard also applies glazes unevenly to mimic the tonal characteristics of a landscape painting, resulting in a surface that shifts between areas of pale and heavy glaze, with some sections left to reveal the core of clay beneath. As the artist discusses, “I consider light against dark. Textured areas within oxygenat- ed areas. Allowing the mark making to show through, allowing the making at all times to be on show... ring and re ring until the glaze appears old and with depth”. Colours often selected depending on the nished form and Leonard utilizes so er tones for stronger works to avoid the colour dominating the form. Palettes are often “slightly bodily”, like her esh like pink, smudgy whites, deep blood reds and purples. These sit in contrast with shots of gold, luminous mother of pearls or hot pink and yellow. While blues, hand painted motifs or decals, reference the history of ceramics or are used to make the work appear more formal. Although, as Leonard explains “I will always rough it up a bit at the end. So I will push heavy blues over the top and make them drip and ooze”. Leonard’s relationship to the making itself is what ultimately informs this artist’s compelling ceramic practice - “I think the most important thing for me is to trust my process as I am really not making work in the traditional way and if I begin to second guess myself the work becomes too tight and there-fore loosens its intention of been gestural and bodily...But I trust my process so I know something magical will come out of this in the end”.